It's safe to say that Fez M. from Northampton, England's trading is going really well right now. He just became the first trader funded by TopstepFX in forex and TopstepTrader in futures after passing the TopstepTrader Trading Combine® yesterday. Plus, in a month of trading a live TopstepFX Funded Account®, Fez has racked up profits, even making $2,700 in withdrawals. We recently sat down with Fez, a former techno DJ, to talk about his journey trading, what got him into markets and what advice he would have for others. Here’s what he said. 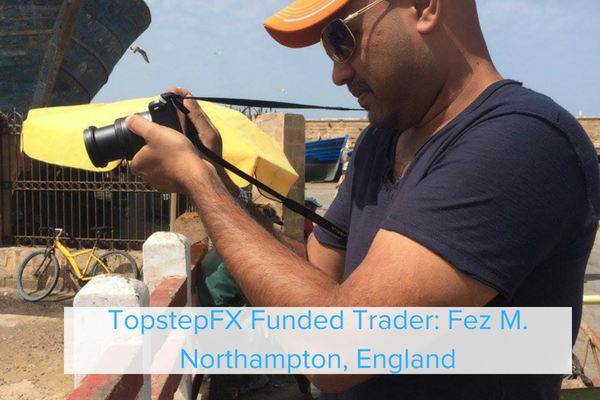 Join Fez and TopstepFX's other funded traders today! It all started with a documentary. Fez, who has been trading for two years, found his passion after watching a BBC documentary called "Traders: Millions by the Minute" (available on Vimeo). That documentary solidified what Fez knew: that his decade-long career in recruitment was not where he wanted to spend his next decade. Instead, he wanted to reinvigorate his background and education in economics — and now he had an idea how to mix his interests and his passion: trading. He joined a trading firm that was known for education to learn about markets and trading strategies. From there, his passion really took off, and with hard work, the rest has built on itself. Is the "funding and good risk management rules," according to Fez. He even went so far as to credit the rules for helping his trading progress. Passing the Trading Combine in futures and forex is good trading. Here's his secret. Fez said that a secret to his success was understanding that "no one ever went broke from taking a profit." That knowledge is no much of a secret, but implementing the knowledge certainly is. At Topstep, we like to say that good trading is simple — it's not easy. That's something that Fez grasps, as he continued to emphasize risk management throughout the interview. Fez said that he really trading well on a short time frame right now. He is "in and out of the market due to huge amounts of headline risk." But that doesn't stop him from making profits. To do this, he says that he splits the market into sections and even moves away from his desk if he needs to. 3 Pieces of Advice for the Trading Combine. "Don't try to trade everything. Be a master of one or two major pairs." As Lydia Finkley told us in her Limit Up! interview, different pairs have different ebbs and flows. They work differently. And you can't trade them all well. So don't trade those pairs you don't trade well. Simple, right? "Don't hold overnight positions unless you know how to hedge properly." Fez means that traders should have positions that offset major positions while they aren't watching. Basically, anything can happen while you are away from your screen. "Technicals win battles, but fundamentals win wars." Fez said that traders have to check the economic release calendar before they put trades on. Sounds like someone who may have been burned in the past. Don't worry Fez, we have be burned too. Do you think you have what it takes to earn a Funded Account? Start trading now.